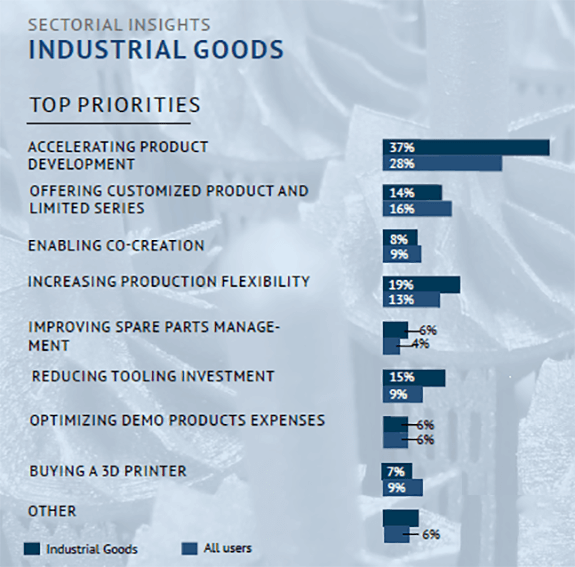 Recent survey results from a 2017 Sculpteo survey highlighted the top priorities of 3D printing for the industrial sector, in terms of what they want to achieve with 3D printing. It seemed to us that these 3D printing priorities implied that they are also benefits of 3D printing, and some of these benefits are ground-breaking enough to the design and manufacturing industry that they deserve more clarification. The Sculpteo survey was answered by over 900 respondents, 60% of whom work in Europe, and 30% of whom work in the US. If you’re interested in checking out the rest of the survey yourself, see the link at the end of this article. Accelerating Product Development: By far, the highest priority for respondents is to accelerate product development. 3D printing can vastly speed up product development by making it possible to print several iterations of a part in a matter of days, leading to shorter development cycles; and more iterations increases the chances of a better design. Offering Customized Product and Limited Series: If your product does not (or not yet) have a huge target market, it’s more economical to print the parts rather than engage in costly manufacturing processes such as machining molds from steel. Because 3D printing is cheaper than traditional manufacturing for low-volume production, it also becomes possible to affordably manufacture limited run products for demonstration and specialty purposes. Increasing Production Flexibility: Production flexibility is a distinct advantage that exhibits itself in a dizzying array of ways; production volume of 1 to 1000 or more units, materials flexibility that ranges from dozens of plastics and alloys, finish flexibility, layer precision flexibility from 400 microns to 20 microns, and even design flexibility, making possible geometry which cannot be duplicated by traditional manufacturing methods. Tooling doesn’t need to be well-finished or particularly pretty. Tooling often doesn’t have the same material strength needs as a final product would. Mold tools generated by 3D printing can be used for low-volume injection molding purposes; they’re also faster and less expensive than metal molds. Lack of tooling is often what slows down production, so if you can generate your tooling faster, production is unhindered. Local Motors (an automotive manufacturer) has seen cost reductions of roughly 50% and time savings of 90% by using Makerbots to create tooling. This article mentions that Makerbot’s tough PLA is strong enough for Local Motors to tap and thread into it, cutting down on the number of steel components that need to be machined, or purchased and shipped, thereby cutting costs and speeding up manufacturing. Read more about Local Motors use of 3D printing. The ability to quickly and economically print spare parts. No need to warehouse and track spare parts. No need to transport parts from the manufacturer. The ability to print a 3D part “on demand” from a location near the customer. The development of hybrid physical and digital inventories, with declining stock levels due to 3D printing’s ability to provide parts within a few days. As more products are made with fewer parts, due to 3D printing’s ability to consolidate many parts into one, there will be fewer parts in inventory overall. TransMagic STL Mesh Optimization allows for different approaches. If you are printing in 3D, you may have need for a tool which can view all major 3D CAD formats, make CAD model repairs when necessary, and convert CAD models into STL and Obj formats for 3D printing. 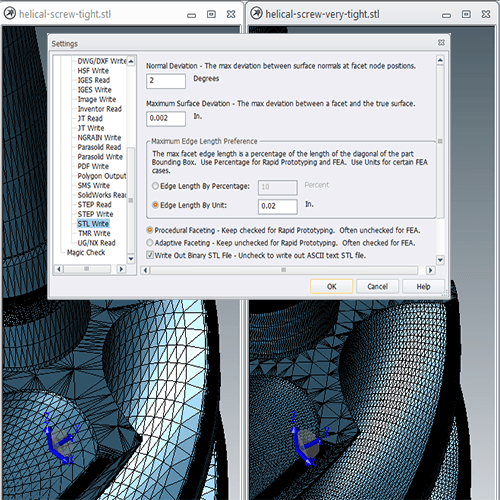 Several STL output options give you the power to get the mesh density where you want it, and a Polygon Reduction tool allows you to drag a slider to see what the resulting mesh will look like in real time. If you’re not already a TransMagic user, try taking the TransMagic 7-day trial for a spin. Learn more about TransMagic products here. Full survey results: Check out Sculpteo’s 2017 State of 3D Printing results here. Thanks to Scupteo for their informative study as well as permission to reprint this graphic.